SUMMIT COUNTY – You’re a conscientious recycler. You ride your bike and take the bus around town. You’ve changed out your incandescent light bulbs for compact flourescents. But when you’re in party mode, there’s a sea of trash as far as the eye can see, and you’re not sure how to bring a sense of sustainability to your entertaining. 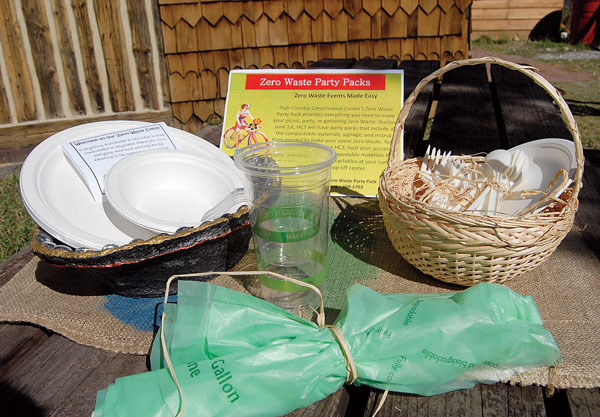 For green-minded hosts like you, High Country Conservation Center (HC3) has introduced the Zero Waste Party Pack – a set of tips, resources, advice and materials that can maximize fun while minimizing waste at any gathering. A party organizer or event planner need only call the conservation center a few days ahead of time to reserve a party pack and arrange a time to pick it up. The packs, designed for small and medium-sized events, include compostable cups, plates, cutlery and other service items that cost about what you’d expect to pay at a local store. Hosts also receive compost bins and liner bags. “We talk through what’s compostable and what’s not, and we give them signage that gets the message to all their guests. We even have table tents that tell the entire party, ‘You’re now entering a zero-waste zone,” Makowsky said. Staff are even on-hand to offer advice on zero-waste decorations, crafts, food products and other entertaining needs. After the event, hosts bring back the bins and any bags of compostable material, and the HC3 staff will send them to the High Country Composting facility in Keystone for $5 per bag. “Within about 90 days, it all turns into nutrient-rich soil amendments,” Makowsky said. Hosts are responsible for bringing their recyclables to a local recycling drop-off center or using their own curbside service. The green-party program got rolling this summer, and Makowsky said it’s already a hit among locals. She has even helped a few Summit County residents throw zero-waste weddings. Within the next year, the conservation center plans to purchase collection containers that have the same look and feel of the zero-waste stations used at some of the community’s largest public events. “When people see them at smaller events, it will ring a bell, because they’ve seen them before,” Makowsky said.